Increase your productivity without any large investments and use the capability of your available measure machines. We help you to modernize your machines for your ideal use. Please ask us! We are glad to submit you an individual offer. The measure machine's mechanics is often still up to date after some years. But problematic is the trend of electronic and software which is going on. There are often many changes after a short while. New calliper can be activated, new operating systems can be upgraded, large data volumes can be processed in a short time and clouds of points of high density can be scanned. Furthermore CAD-data can be imported / exported and graphical protocols can be generated. The programming is very easy to understand and work with. Many further points would be still enumerated. Many companies have recognized the potential and modernize the software and control engineering of the big measure machines. 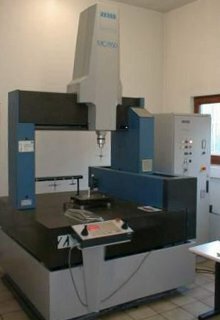 We will take on the support, the service and the calibration after our modernization of your measure machines. 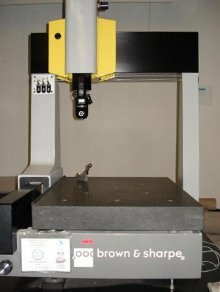 We calibrate with detailed laser interferometers, ballplates and callipers. For big measure machines we use ballslats to calibrate. The calibration takes place in ISO10360 or in VDI 2617. You will get a calibration journal of the happened calibrations which are documented every measured data. This calibration journal is affiliated to the "German Calibration Service". The functionality and the easy usability of the software are especially important for the decision to work with a RETROFIT. The measure software CAPPS has essential vantages. The large communications interfaces give new flexibility and potency of the processes. Data can be imported, processed and exported. 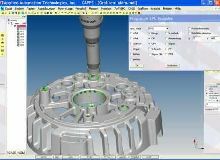 CAPPS measuring software offers you a cheap access into the coordinates measurement technique. CAPPS comes up to all measure duties and is upgradeable to higher levels of expansion. There are direct interfaces to tool machines. This software offers you a good price-performance for manual CMMs as well as for automated CNC-controlled Measuring Machines.